Just like all animals, dogs experience various life stages and their nutritional needs may change depending on these stages. It is also true that your dog’s lifestyle will have an impact on his needs. Dog diet requirements for highly athletic or working dogs will be very different than for a much more sedentary dog… even if they are the same breed, age and size. We have broken down dog life stages into four basic categories in order to provide some fundamental guidance. Note: each of the dog life stages do not necessarily require a dog food change. Please click on the life stages below to learn more. 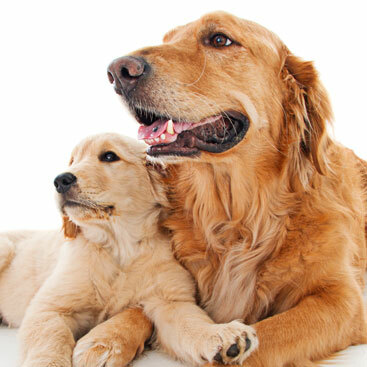 In the first six weeks of a dog pregnancy, a dog does not need any extra nutrition. Just like people, some dogs also experience morning sickness and may avoid eating full meals. If this continues consult your vet. After the first 6 weeks of the dog gestation period, and every week thereafter until the puppies are born, you should increase her food intake by 25%. During the dog gestation period, she should be fed smaller meals more frequently because the puppies may be constricting her stomach. As always, make fresh, clean water accessible at all times. After giving birth, your dog should be fed puppy food while nursing. It is important to feed her a nutrient-dense food with proportionally higher nutrients for the nursing process – this will also aid in recovery from the dog pregnancy. As in the gestation period, she should be fed smaller portions more frequently – 5-6 times per day is ideal. As soon as the puppies are weaned, she should transition back to her regular adult maintenance dog food and be fed as she was before the dog pregnancy, according to her ideal adult weight, based on size and dog activity level. Puppies require a larger quantity of food and need to eat smaller meals more frequently. Feeding puppies should be done four times a day until they are four months old, three times a day until they reach 6 months old and then twice a day, just as adult dogs. Feeding puppies for maximum growth is not advised. Therefore, free feeding dogs (leaving a bowl of food out for him to eat at his own discretion) is not recommended. Steady and consistent growth should be the objective as this builds a foundation for future dog health. Excessive feeding will not lead to a stronger, healthy dog. No matter how much you feed your dog, he will only grow as big as he is predetermined to grow. To determine how much to feed your puppy, first establish what his estimated adult dog weight will be. Feeding a puppy is based on a combination of his size, age and estimated adult body weight. Proper nutrition is the foundation for his growth, muscle and skeletal formation, immune system and brain function. The recommended feeding schedule for adult dogs is twice a day. The predetermined volume of dog food should be divided into two equal portions and fed 8 – 12 hours apart. 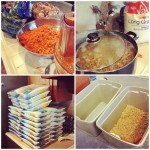 Adjust the quantity of dog food as needed to sustain the ideal adult maintenance weight. Adult dogs require enough calories to meet their energy requirements as well as to maintain and repair body tissue. They should be fed based on their size and activity level. A very active dog could consume as much as 20 – 40% more calories than the average “maintenance” dog, even though they may be the same size. An inactive dog may need as much as 10% fewer calories than the average “maintenance” dog. If your dog has reached his golden years, you have probably noticed the signs, such as a lower activity level and perhaps becoming grey around the muzzle. One of the most common problems at this stage is dog weight gain. This can be controlled by decreasing the caloric intake as needed. Seniors require a high quality, highly digestible protein to maintain good muscle mass. There is no nutritional basis for a “senior” dog diet, per se. 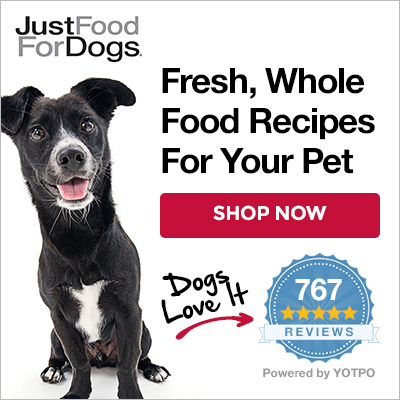 Some dogs, senior or otherwise, may have specific dietary needs and those specific needs can be met through one of our Custom Food Formulations which is designed specifically for your dog.